Rambutans are small red colour fruits with spiky hair on the skin. It has a sweet, juicy flesh which is slightly acidic and small brown coloured seeds whose oil is used in a number of industries. Rambutans are available in two colours, red and yellow. The rambutan is botanically named as Nephelium lappaceum. To people of Malaysia, Thailand, the Phillippines, Vietnam, Borneo, and other countries of this region, the rambutan is a comparatively common fruit like an apple which is common to many people in cooler climates. Rambutan is the native fruit from Indonesia and Malaysia(wikipedia). 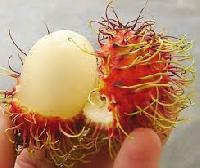 The benefit of rambutan can be equated with other favorite fruits, like oranges and apples. Rambutan contains phosphorus, iron, protein, fat, vitamin C, carbohydrates, and so on. Not only fruit, rambutan skin also contains tannins and saponins. Seed that contain polyphenols and fat also makes rambutan more special, because in addition to tasty fruit, it also has many benefits. A good rambutan has a firm and juicy flesh. It has a sweat taste, and it is somewhat similar taste of lychee fruit. The tree will actually look like a enlarged Chirstmas tree. A rambutan is best within mid season somewhere around June August as they seem to be most sweet, and large.. It is more sweet than sour. When it gets ripened the flesh separates easily from the seed. But when it is not quite ripe, the flesh sticks to the rambutan seed and the taste is a little sour overall, still not a bad taste though. Rambutan fruit is naturally red in color but they sometimes seem like yellow or orange. 'Rambut' is a malay word which means hair, hence it got its name because of the Thorn like appearance. 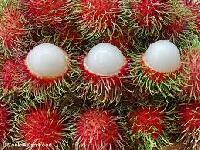 The shape of Rambutan fruit is round or oval and it is upto three to six to four cm in dimension. Rambutan is borne in clusters. Its leather like skin has flexible thorns. It has brownish seed with two to three cm in size and is basally scarred. It is soft and crusty. Rambutan benefits are due to the fact that the fruits have rich amounts of proteins, carbohydrates, fats, iron, phosphorus, calcium and Vitamin C. The stem of rambutan contains saponin, tannin, iron, pectin substances and flavonoids. The seeds of the fruit contain polyphenol and fat. This fruit is a traditional medicine in Malaysia and Indonesia that is being used for hundreds of years. It is used in a number of treatments which includes diabetes, hypertension and various other ailments. rambutans are also a good source of copper. Although your body require only a small amount of copper, this trace mineral is crucial for the proper functioning of your body. A copper deficiency may lead, for example, to anemia, ruptures in blood vessels, bone and joint problems, elevated cholesterol levels, frequent infections, and chronic fatigue. The carbohydrates and protein content of rambutan help to increase energy and prevent bloating. Rambutan is also rich in water which helps to get back the lost energy and quenches thirst. Nutrition facts for rambutan pulp (Nephelium lappaceum) are provided per 100 grams in the chart below. The nutrition facts provided below include both the absolute amount and the percent daily value for each nutrient. Vitamin C in Rambutan helps in the absorption of minerals, iron and copper. It also protects the body from getting damaged from free radicals. If you have yet to try a rambutan fruit, head to a supermarket near you and pick one off of the shelf. With all the rambutan benefits and the goodness in every bite, you might just have found a new snack and favorite fruit to help you in achieving your goals for a healthier and better you. The main compounds of rambutan is Gallic acid. This compound behaves like a free radical scavenger that protects our body from oxidative damage and is particularly helpful to fight cancer. When you eat rambutans or other foods that are rich vitamin C, you increase your body's natural ability to flush out heavy metals and other toxins as well as to deal with stress. Vitamin C also promotes healthy, youthful skin by scavenging free radicals and by enhancing your body's ability to produce new collagen. This fruit contains moderate amounts of copper which is necessary for the creation of white and red blood cells. 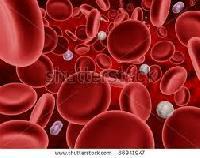 It also contains manganese which our body needs to produce and activate enzymes. 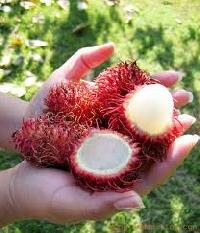 You can also use peeled and pitted rambutans in smoothies and fruit salads, for example as a substitute for lychees. If you have a juicer at home, rambutan juice spiced up with a bit of cinnamon or vanilla is also worth a try.